On The Water, LLC. is a Mississippi State commercially licensed marine contractor. Locally owned and operated by a lifelong Mississippi Gulf Coast resident, customer care and quality construction are top priorities. At On The Water, LLC we take pride in each and every project. We use only top quality marine materials and hardware. Our team of talented and dedicated carpenters can make your dream design a reality. From basic construction to one-of-a-kind customization, there is virtually no limit to what our team can produce for you. We specialize in piers, seawalls, retainer walls, boat houses with lifts as well as marinas and harbors. 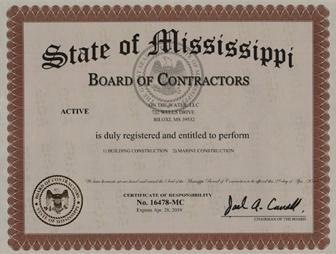 Our company holds a Mississippi State Commercial Builders License & Marine Contractor's License (Eligibility Certificate #16478-MC). We also carry more than adequate insurance for land projects and insurance specific to marine construction. "We'll get you... on the water!" Piers, seawalls, boat houses & lifts.